Replies: 137 (Who? ), Viewed: 181755 times. #1 24th Apr 2008 at 1:57 PM Last edited by leesester : 17th Oct 2011 at 9:00 AM. What is this tutorial for? From the Pets expansion onward, certain accessories categorized as glasses would flash blue when worn by sims. This could be fixed by taking the sim to the mirror and having them Change Appearance, but this would only fix it temporarily. Thanks to JM Pescado, we now know the cause of why this happens to certain accessories and not others, and most importantly, how to fix it. This tutorial will explain the steps of how to fix an accessory that flashes blue. This tutorial is mostly meant for the accessory creators to fix their own work, so they can upload fixed versions for everyone to enjoy - but it can be used by downloaders to fix items that the mesh creators won't fix. It is written in a format that hopefully should be easy to understand, even if you know nothing about SimPE or meshes. This tutorial is ONLY for flashing blue accessories! It doesn't relate to flashing blue anything else! What causes some accessories to flash blue and not others? When a user creates a custom accessory, they will be cloning that accessory from a Maxis accessory. Maxis accessories usually have a number of groups. For example, the accessory they're cloning from may have the groups: frame, rim, and lens. However, the user making the accessory may not need all three groups, and may only need to use one - for example, the "frame" group. The proper way of making an accessory when you do not need all the groups is to make a small "placeholder" group in your mesh - that is, a single polygon named the same as the group(s) you are not using... so in our example, the user would make two placeholder groups - "rim" and "lens". Meshes created properly, with placeholder groups for the unneeded groups will not flash blue. If the user creating an accessory fails to create placeholder groups and simply leaves them out, creating an accessory with only the "frame" group while the mesh is cloned from an accessory with more groups and is expecting more groups, you will get a flashing blue accessory - when those groups can't be found, the game goes, "Ack!" and breaks the accessory temporarily. This can be fixed by putting back those placeholder groups. SimPE - I am using v 0.64a, but this should work in most any version. Managed Direct X 9c - You will find a link to this on the SimPE download page, under "Needed Software to run SimPE" - because you are working with meshes, you will need this. My Placeholder Obj File - This is what actually fixes the mesh. Download the .rar file and extract the .obj file from it, to a folder where you can find it. The mesh file of the accessory you wish to fix. 1. Open the mesh file in SimPE. For my example, I am fixing Ren's #3 Elf Ears as Ren's accessories are well known to flash blue. 2. Find the list of expected parts. Before we can fix the mesh file, we need to find what parts the mesh is expecting will be there - we know at least one is missing as the accessory flashes blue, but we don't know what it is called. For that, we need to look in the SHPE file. A. Look at the left pane in SimPE. You will see where it says "Resource Tree" up at the top. B. Click on the line that says "Shape (SHPE) (#)" in the list. My mesh file has the number 6 showing there as mine has multiple meshes in the same file, for different ages. Yours may have one or it may have more. C. Look over on the right pane. You will see where it says "Resource List" up at the top. This list will have changed when you clicked on the SHPE, showing only SHPE files under the "Type" column. D. Click on the first SHPE file in the list. If you only have one, just click on the only SHPE file you have. E. Make sure you are using Plugin View. You should have a tab for it along the bottom or the right side. If you do not see this tab, click on the Window menu, and then choose Plugin View to bring it up. F. Under Plugin View, you will see a list of tabs under the lines that are labeled Blocklist and Filename - cShape, Level of Detail Listing, Items, Parts, and ObjectGraphNode. Click on the "Parts" tab. G. You should now have a list of two to three items showing in the box below. This tells you what parts the mesh is expecting to be there. Write down the names of the mesh parts - you only need the part before the colon (the : symbol). So in this case, I have two parts, called "louis_ac01" and "louis_ac02" so I will write down those names. Now that we know the name of the parts our mesh is expecting and how many parts it should have, we can add in any missing parts into the mesh file. A. Look in the left pane, the Resource Tree. B. In the list of items, you should see "Geometric Data Container (GMDC) (#)" - click on that item to get a list of the GMDCs (meshes) in the file. C. Now, look in the right pane, the Resource List. This list will have changed when you clicked on the GMDC. You should only have GMDCs listed here. You may have one, or you may have more. D. Click on the first GMDC in the list. If you only have one GMDC, click on the only GMDC you have. E. You should still be in Plugin View from before. F. Now, look at the list of included mesh parts. As expected, this mesh is missing a part - the only part we have listed is "louis_ac01" when it should also have "louis_ac02" as well. Because it's missing a part, it's flashing blue. We need to add in the missing part. G. Click the Import button. You will now get a dialog box labeled "Import Mesh." Find the placeholder.obj file you downloaded at the start of this tutorial (found under the "What you will need" section), select it, and click Open. 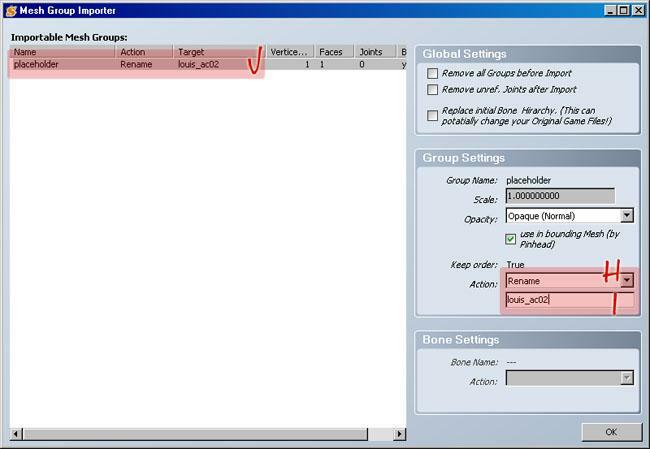 Now you will get a dialog box that pops up labelled "Mesh Group Importer." H. Over on the right, change the dropdown box labelled "Action" to "Rename"
I. Then, change the box below that to the name of your missing mesh part. In this case, my missing part is called "louis_ac02" so that is what I will call it. If you have more than one missing part, give it the name of the first missing part. J. When you have renamed it, the area under "Importable Mesh Groups" should look like this... "placeholder - rename - (your missing group name)." Click OK to import the part. K. Now you should be back to the GMDC in Plugin View. Look in the Models list and you'll see that you now have the missing part in place, with the correct name. L. Click the Commit button to commit your changes. M. If you have more missing parts, repeat steps 3G through 3L above to import any further missing parts. Make sure to Commit when you are done. 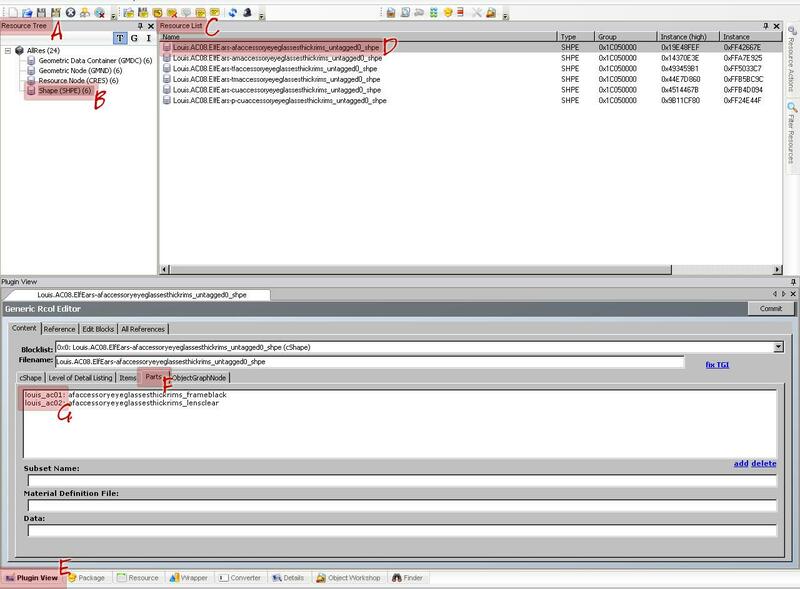 N. If your mesh file has more GMDCs, repeat steps 3E through 3M above to fix all of the GMDCs in the file. Make sure to Commit when you are done. When you have finished editing all of the included GMDCs in the file, go to the File menu and choose Save to save the changes to your file. Go into the game, load a lot, and put your accessory on a sim using a mirror to Change Appearance. Save the lot, exit to the neighborhood, and re-enter the lot. With any luck, your edited file should not be flashing blue. If you still get flashing blue, or if the game crashes when you try to put the accessory on a sim, you likely messed up somewhere along the way. If this happens, go back to the folder with your edited mesh file. 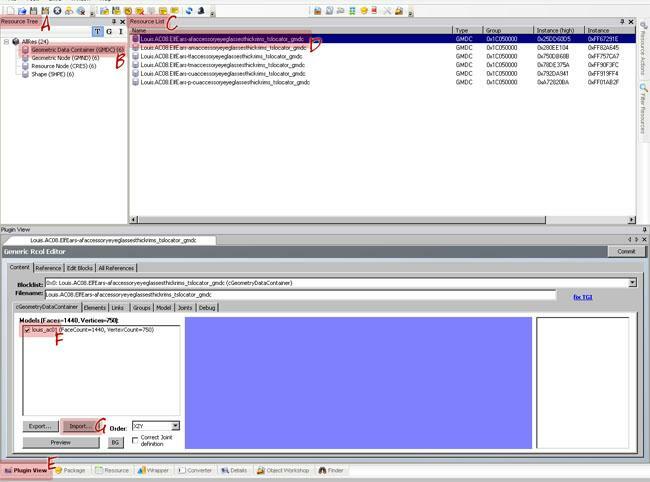 You will see that there are two files with the same name - one with a .package file extension (this is your edited file) and one with a .bak file extension (this is a backup made by SimPE). We only saved once at the very end so that the .bak file would be a copy of the unedited mesh, before you started trying to fix it. Delete the .package file and rename the .bak file to .package and then try again. With any luck though, your edited mesh file should work just fine. #2 13th Jun 2008 at 1:12 AM Last edited by BlueBlood220 : 13th Jun 2008 at 2:07 AM. Reason: New question. Thanks for this, HP! I was getting so tired of the flashing blue everywhere as I use accessories quite frequently. But I ran into something I don't know how to get around. I opened up a mesh that I know for sure flashes blue in game. I can't miss it because it's a huge scarf. It's definitely not missing anything, but quoting your post here, 'The proper way of making an accessory when you do not need all the groups is to make a small "placeholder" group in your mesh - that is, a single polygon named the same as the group(s) you are not using...' The lens part doesn't have any polygons, so I guess that's why it flashes blue anyway. Can I replace it with your placeholder somehow? Edit: Nevermind, it's cool. I found the replace option in that dropdown box. Edit again: I'm not sure if I would always be able to discern if a group is a placeholder or not or if all meshes really need a placeholder, like if they use all the groups for something, but if it has more than one polygon will that still break it? I have a mesh that I'm pretty sure flashes blue, but it's not missing any groups. The group that I would bet on as being a placeholder has more than one polygon though. A placeholder group doesn't always have to have one polygon. The key is basically that all groups referenced in the Scenegraph chain actually exist in the GMDC. Whether those groups have 1 poly or 100 doesn't really matter. Story books are full of fairy tales, of Kings and Queens, and the bluest skies. BlueBlood220 - If you can link me to the mesh you're having trouble with, I can take a look and tell ya what's going on with it for sure. #6 20th Aug 2008 at 3:30 PM Last edited by ScorpioMaurus : 29th Aug 2008 at 5:20 PM. Cyjon has created a hack that in my game takes the Vampire Fangs away so they don't flash. This way you can fix General Zoi's fangs and have real Vampires that don't flash. Version 1 works with all EP's through Seasons. If you have Bon Voyage, FreeTime or Apartment Life you must DL version 2. I have tested these under several different circumstances and it is working properly for me. However I understand for some people the fangs do show normally. Under my configuration the fangs do not show but it is not a problem thanks to General Zoi. thank you forever HP! I thought until I saw this that these accesories flashing blue were only a problem of mine! thanks! now I can have elves! Thanks so much! I was wondering why they would do that and I was scared that they would never be able to be used. This is a great tut! I've been looking for a way to fix some things. But on the SimPE site, there is no actual link to the Managed DirectX 9.0 or anything of the sort. The link goes directly to the Main SimPE download, and the direct link goes nowhere. Now that wouldn't bother me if I felt like downloading ALL of DX from Microsoft. Is there any links anywhere that for sure ONLY have MDX? I'm not going to spend 2-4 hours downloading something I already have, only to get a small bit of functionality. And I wanted to ask- does anyone else have the problem where everything their vamps pick up turns blue? XD I even have blue babies, lol. char_sama - The link on the SimPE download page for Managed DirectX is a direct link that only downloads that, not all of DirectX. As I was saying, when I click on the link for it on SimPE's site, it just goes to the main download for SimPE. The direct link option on the SourceForge.net was, until just a moment ago, not going anywhere. Now, I'll assume someone changed it just now, or it was some random error that killed itself about 12 times, b/c that's how many I tried it. Had some trouble with some necklaces. The preview was okay, but in the game they flashed blue :-(. Now I have some work to fix it, but thank you again for showing me the way! #13 4th Sep 2008 at 11:14 PM Last edited by Simsane : 5th Sep 2008 at 9:42 PM. Hi HP, just wanted to ask if this is the same method to fix windows that flash blue as well. There's been a couple of times where I downloaded a lot and everything but one particular window would be fine. What I've done in the past is to replace the window with one that didn't flash and then delete the "blue" window from my build mode catalog. But if this method would also fix windows, that would be wonderful. Oh, and thanks for taking the time to make these instructions in the first place. ETA: Thanks HP. I already have the latest CEP already so I will continue doing what I've been doing. I do understand what you mean as I have used the Grand Trianon objects since they came out and understand "repository" techniques. Thank you for responding so quickly. Simsane - That's usually due to a missing parent/master/repository file. For example, stuff like Numenor's WallWindows use one item to hold the recolours (parent/master/repository file) and the rest (child/slave files) get their recolours from it. That can also be due to some other issue with the files, or CEP related. This would not fix windows. The parts used were "frame" and "lens"...but in GMDC Plugin View, I saw a few "gloves" unchecked, so I imported the missing parts and then checked all the "gloves." Is that right? LostSaggatarius - This is a permanent fix for any accessories flashing blue. If you delete them and re-get the same ones they'll just develop the issue again. This fixes it once and for good, forever. pseudonymph24 - Checked or unchecked is irrelevant. As long as they're present, they should work fine. i dont understand ny of this!! Jake Lucas - This ONLY relates to flashing blue accessories. Has nothing to do with flashing blue -anything- else. Thanks for the awesome tutorial. I went through my accessories last night and fixed all the ones that didn't work. It only took me about a half hour and is very easy to do. I just have one problem.. one of the ones I downloaded didn't come with a mesh file. How do I found out which mesh it works from? It flashes blue in game and it's one of my favorites that I used to use all the time. Kilani - Try going back to whereever you got it and seeing what mesh they say to download. If that fails you can try opening whatever files you suspect might be the mesh and looking for the right resources. Meshes will generally only have GMDC, GMND, SHPE, and CRES. Recolours tend to have a lot more stuff including 3DIRs, XMOLs, TXMTs, etc. so you can tell the difference right off looking at the contents. I can not for some reason get the necklace mesh to work. It has all the parts it should according to the tutorial, but still flashes blue in game. It's supposed to have; frame & lens. I checked all GMDC and they have the same. Any idea why it still doesn't work? ive fot a sailor moon accesories flashin blue or being left behind. Kitten- Did you try following the tutorial to fix it?